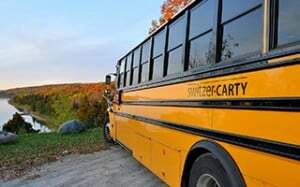 Switzer-Carty Transportation drivers are some of the safest, best-trained professionals in the industry. Trainees undergo weeks of comprehensive hands-on training. Our Training program features technical skills development, bus environment management, student discipline and customer service. Drivers learn through real-life scenarios presented in classroom, homework and practical sessions. Trainer evaluation and final government mandated road and written tests determine when a driver is qualified to drive our buses. Our team of drivers participate in continuous improvement and on-going training programs that we believe rank them with the best on the road. Drivers enjoy the benefit of an annual review through our Driver Evaluation Program. The driver is accompanied during their school bus run by our team evaluator who checks for proper driving, as well as student management skills and ensures that risk areas are identified before safety is compromised. Collisions on the roadway are inevitable. We pride ourselves on our safety record. When a driver has been involved in a collision our team of professionals identifies any area of weakness. The driver undergoes any refresher training required to ensure that any issue is corrected before another accident occurs. Learn more about our focus on safety at Switzer-Carty Transportation.